Like many of us, I never heard about King Kong, the first perfume from Kenzo, until I read this 2007 post on Perfume Posse. Between the notes (banana, spices, clove, mint, green notes, rose, amber, resins, oakmoss) and the name, King Kong sounds so wonderfully outrageous I had to get a bottle; and I did. Which turned out to be a very good thing because I absolutely love it. Kenzo King Kong was released sometime between 1978 and 1980. 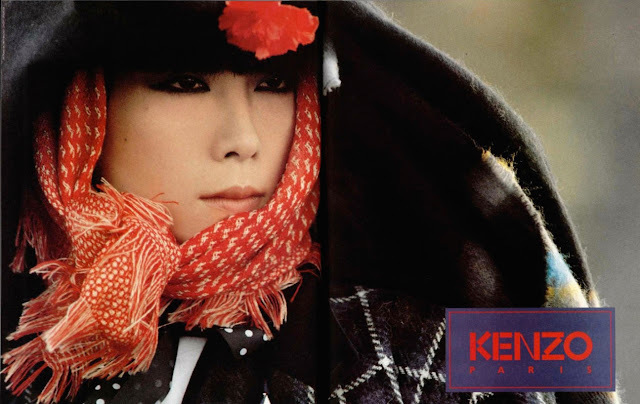 It was gone from the market in the mid 1980s and obviously forgotten by the time Kenzo sold the perfume license and launched the eponymous fragrance in 1988, which is what most of us thought as the first Kenzo perfume. But King Kong wasn't part of that commercialized let's-bank-on-the-designer's-name LVMH-ization process. It came to the world as part of the quirky fashion and design concept of Kenzo, yet like the clothes, it's delightful and wearable. Kenzo King Kong is basically an oriental fragrance with a bright green opening that becomes sweeter and thicker as the banana note takes hold. It's a green(ish) banana, not mushy at all, and it plays well with the exotic jungle theme. I love and wear another banana fragrance, Jean Patou Sira des Indes, but I admit that tropical fruity floral is not exactly a genius composition. It's pretty and it's fun, but it doesn't stir the soul, while King Kong's greenery and thick rainforest have a certain romance and longing to them. The green banana is the hook that pulls me in, then I get ginger and an almost chypre-like rose action; the spices and the resins become warm and thick, lovingly caressing the skin. I think I smell sandalwood and smoky tree sap that makes me think of pollution that entered the forest. It's a bit melancholy. As King Kong dries down it becomes slightly sweeter but not necessarily too femme. I think this stuff is wearable to all, as long as one can deal with a banana and the wide lush leaves that rot a little as they fall on the forest floor. Kenzo King Kong is a great reminder of a time when "designer fragrance" meant a connection to the fashion designer's work, as well as a certain prestige and quality that came from the artist's willingness to have his or her name on a bottle. Jessica Lange in King Kong, 1976, via IMDB. 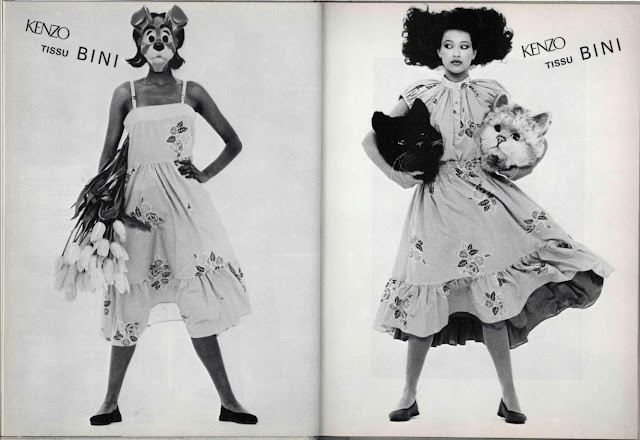 1980s Kenzo lookbook images from around the web. I didn't think this was still available. Would you happen to know where I could buy it? Hi, Robin. Unfortunately, King Kong isn't easy to find. I got it from a German eBay seller. My best advice would be to set up an eBay search with email notifications so that it'll alert you if another bottle comes up on the market.